The Nexus 2N Skates continue to offer the unique Nexus fit, but the performance and control it delivers is the exactly the same as you get from every other high-end Bauer skate. Compared to the other flagships skates in the Bauer Skate lineup, the Supreme 2S Pro and the Vapor 1X, the Nexus 2N skates are certainly not as flashy and feature laden at first glance. Up close you will notice the 2N skates have come far from the more bulky Nexus skates of the past with its smooth Curv Composite contours. In a recent Instagram Stories Q&A, we received many questions asking “where is the 2N Pro?!”. Understandably with the concurrent release of the Pro level 2S Pro, and the Elite level 2S skates it would make some sense to see a 2N Pro and 2N skate. Simply put, there is no 2N Pro skate at retail. The 2N is the retail flagship Nexus skate for 2018. It therefore comes in cheaper than its Nexus 1N predecessor, and Supreme 2S Pro and Vapor 1X flagship skates. The Nexus 2N skates continue to offer the now familiar ‘Nexus Fit’ for players who have a larger volume foot. Players who are best suited to the Nexus fit will have a wider forefoot, high instep and high volume ankle and foot bones. Our skate fit experts have seen all kinds of foot types, some feet do immediately lend themselves to trying on a Nexus family skate from an initial visual assessment. Of course, in store we have a Bauer 3D Skate Lab which customers are free to come and use with the guidance of one of our skate fit experts. No appointment is necessary for the scanner, wait times will vary depending upon store traffic. Simply inform one of the team that you wished to be scanned and they will be more than happy to assist. The 3D Skate Lab will scan your feet to create a 3D virtual model. Our skate fit experts will then talk you through the results and show how your foot shape would benefit from a Nexus, Supreme or Vapor fit. With over 25 years of passed down Skate fitting knowledge, our team will help you find the perfect fit armed with your scan results and skate fitting expertise. Starting with the boot, the 2N is constructed using Bauer’s ultra-lightweight, and highly protective 3D-lasted Carbon Curv Composite. You will recognise Curv Composite from other high end Bauer skates and Vapor protective gear. It is used on these high end products because it offers the elite combination of being both ultra-lightweight and highly protective. The Nexus 2N features a two-piece 42oz black felt Form-Fit 2 tongue. As you would expect in a Nexus skate, the tongue provides a super comfortable and secure fit. The two-piece design combined with pre-curved internals wrap to make the fit on your foot and front of the ankle nice and snug. Running up the tongue is an in built high-density metatarsal guard for added comfort as well as protection from lace bite, slashes and pucks. The Nexus 2N of course comes as standard with the almost ubiquitous TUUK Edge holder. The Edge trigger system allows you to change your steel in seconds should one break or you lose an edge without needing to take your skates off. If you want to carry some extra sharpened steels in your bag for such an eventuality, we recommend a blade pouch such as the Blade Travel bag or the TUUK Travel kit to transport these. The Tuuk LS3 Edge Runner features a taller steel than the LS2. Built for the Edge Holder, the LS3 offers a great turning radius and supreme control, allowing you to make the moves you need to make throughout gameplay. Providing some of the now familiar Nexus comfort levels are lightweight memory foam ankle pads. These pads hug and form to the shape of your own unique ankle bone structure for both comfort and importantly a firm locked in fit for performance. Also helping to ensure that your foot stays locked in place is the Form-Fit+ insole. The grip coating of the insole prevents your foot from moving around which would result in a loss of power transfer and stability. The insole also provides some ventilation to help with keeping your feet dry. The Hydra-Max 2 liner is a favourite amongst pro players. The mesh liner is constructed from a soft fabric which wicks away moisture to help keep your feet dry during play. Being an Elite level skate, the 2N offers a great mix of performance and comfort in a lightweight package. The help reduce the overall weight of the skate, and boost performance, Bauer has built the 2N on a lightweight composite outsole. A full composite outsole maximises energy transfer during a stride. 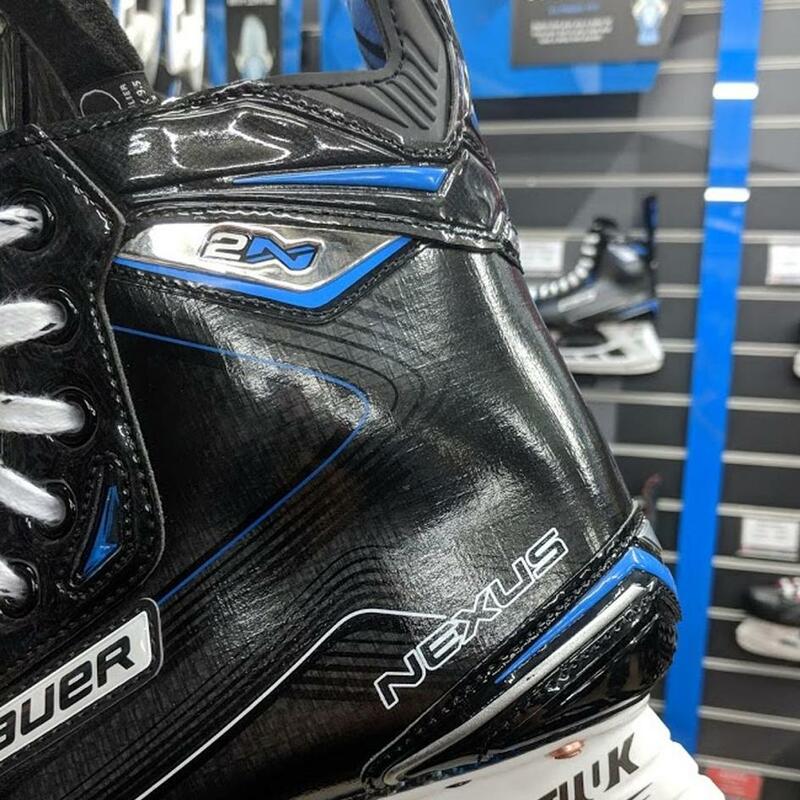 The Bauer Nexus 2N is a vital part of Bauer’s skate fit story, catering for players with a higher volume foot, and for those looking for additional comfort. The 2N offers all players who fall into those categories an Elite level skate in terms of performance and design. If you’ve become accustomed to squeezing into skates that crush your feet from all sides, you may want to consider the Nexus line up to find that mix of performance and comfort. Ideally come and see our skate fit experts in store for a fitting, your feet will thank you!